Ellie Avery planned a perfect family getaway: fun in the sun on Florida's Gulf Coast, with a side visit to the eBay vendor who'd mistakenly sent her the wrong handbag. But what should have been a simple exchange turns into a fatal transaction when Ellie discovers Angela495 floating face-down in her pool. With some savvy snooping, Ellie learns that Angela's dangerous double life included blackmail, compromising photos, and a scandalous secret that threatens a local celeb. When a kidnapping shatters her family's safety, Ellie leaves the white sands behind to face down a killer whose warm Southern charm masks a cold, cold heart. Includes great tips for super family vacations! Wow, this book was so action packed. Ellie sure does get herself into so dangerous situations! When Ellie plans a family vacation to Sandy Beach, FL, she plans on a fun relaxing time spent with family. Needless to say that doesn't happen. Before her vacation even starts, she receives a package that contains the latest designer purse, Ellie's weakness, that she ordered. Well, the package had the wrong purse, so she contacts Angela495, who she gets her purses from, and Angela responds that the wrong purse was sent and that she will meet Ellie to give her the right purse. This is the beginning of a wild, dangerous ride for Ellie and her brother Ben, who actually had dated Angela. This book grabbed my attention from the beginning and kept me on the edge of my seat. Great job. A native Texan, Sara writes mysteries (the Ellie Avery series) and suspense (the On The Run series). As a military spouse, Sara has moved around the country (frequently!) and traveled internationally, which inspired her latest suspense novels. Publishers Weekly called Sara’s books, "satisfying," "well-executed," and "sparkling." 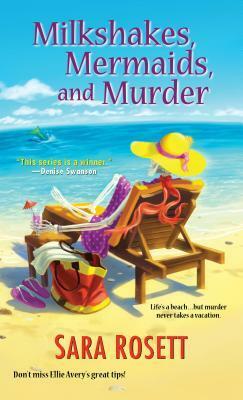 The first Ellie Avery mystery, MOVING IS MURDER, was a Reader's Choice Award Nominee in 2007 at the Salt Lake County Library and received a Distinguished Honor Award from the Military Writers Society of America. Sara's essays have also appeared in CHICKEN SOUP FOR THE MILITARY WIFE'S SOUL and magazines such as THE WRITER, GEORGIA MAGAZINE, and MYSTERY SCENE MAGAZINE. Sara loves all things bookish, considers dark chocolate a daily requirement, and is on a quest for the best bruschetta. Connect with Sara at www.SaraRosett.com. You can also find her on Facebook, Twitter, Pinterest, or Goodreads.